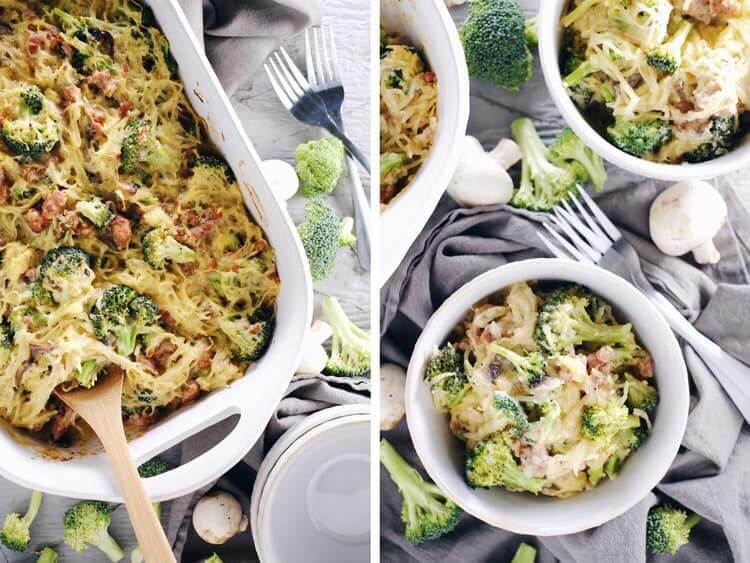 This creamy garlic spaghetti squash casserole is so saucy and delicious! Do you long for a creamy, dairy-free sauce packed with garlicky goodness? Well, look no more! Plus, this dish is made with spaghetti squash, which is a much healthier casserole option. Go ahead, get your squash on, and make a big old pan of this filling and flavorful casserole! We love anything that makes life easier, and finding ways to be more efficient and effective in the kitchen can make such a huge difference in how we feel about cooking and preparing meals. I didn’t always love being in the kitchen, but once I started to plan more and find ways to create delicious meals with the least amount of effort, I really started to love cooking and spending time in the kitchen! 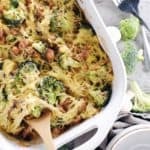 We love this creamy garlic spaghetti squash casserole because there is only about five minutes of prep time, and the hardest part is really cutting the spaghetti squash! Seriously, isn’t that the worst part? Did you know that if you ask someone working in the produce section at the grocery store, they will cut it in half for you?! Yep, there’s a time saving (and potential ER trip saving) tip for you right there! Just saying. This casserole is full of creamy garlicky goodness that just hits the spot! You won’t even notice the spaghetti squash isn’t real noodles, and if you use a spicy Italian sausage, you’ll also get just a touch of heat to go with the creamy deliciousness. We love making a big pan of this to have leftovers on hand because sometimes it feels like the leftovers are even better! While this recipe isn’t a 30 minute meal, we love that it makes enough for leftovers, which can easily be reheated for lunch or another dinner. You could also make and freeze this casserole, and then pop it in the oven to reheat when you are in need of an already made meal. Just note that it may turn out a little more watery than when eaten fresh, and it should be good in the freezer for 1-2 months in an airtight container. We love meals like this since the effort is totally worth the time saved on another day! That’s what our Paleo Meal Plans are all about – making you more efficient in the kitchen! 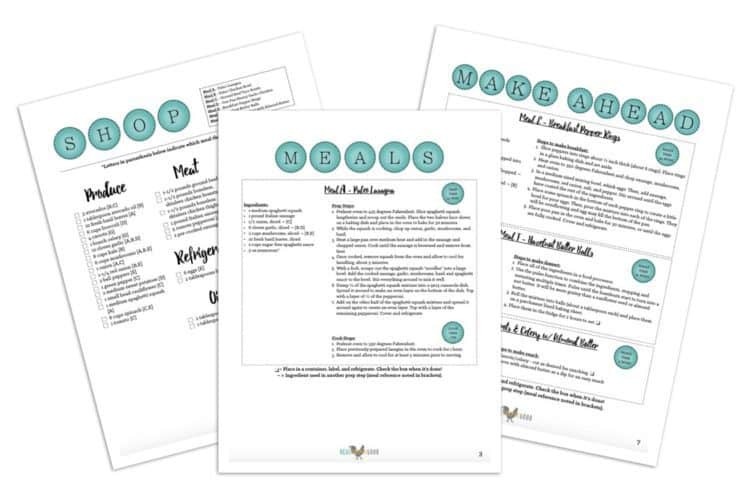 Need a little help getting organized or just want to reclaim some of your free-time? Check out all the details here! Ok, now it’s your turn! 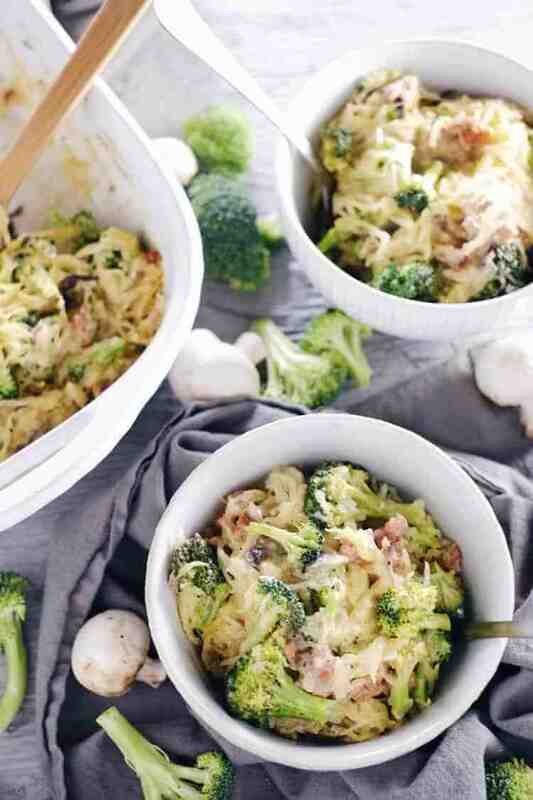 Make a big pan of this creamy garlic spaghetti squash casserole and enjoy the goodness. Let us know how it goes by leaving a comment below. Take a photo and tag us on Instagram @realsimplegood, so we can check it out! This creamy garlic spaghetti squash casserole is so saucy and delicious! While the squash is cooking, get the sausage going. Heat a large pan over medium heat and add in the sausage. Break it into pieces with a spatula and cook, stirring occasionally, until browned and cooked through, about 8 minutes. Remove from pan and set aside. Reserve at least 1 tbsp of fat in the pan for the sauce you'll make later. Next, add in coconut milk, stirring constantly for 2 minutes. Be sure to mix well to dissolve all of the flour into the milk (you don't want any flour clumps). Use a whisk to mix if needed. The sauce will bubble and thicken, keep stirring to prevent burning. After 2 minutes turn heat down to low and simmer. Stir in salt and pepper. Now, put it all together. With a fork, scrape out the spaghetti squash "noodles" into a medium casserole dish. 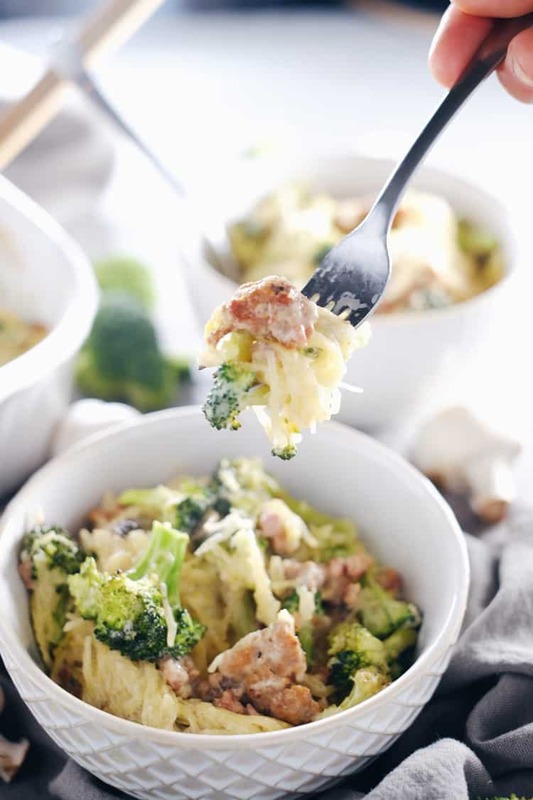 Add the cooked sausage, broccoli, and creamy garlic sauce. Mix everything together well. What is garlic paste? Can you buy it? Made this tonight, and it was FABULOUS!! Make sure the broccoli is cooked ahead of time. I put the florets in a covered dish with a little water and steamed for 4 minutes in the microwave. To avoid lumps in the sauce, treat it like a rue. Put the flour in when the mushrooms are done cooking, and incorporate for about a minute. Then add the coconut milk. This is definitely one of my faves. Thank you for the GREAT recipe!!! We are so glad you liked the recipe and thank you for the tips in your comment! We updated the recipe to incorporate the flour before the coconut milk to avoid lumps. For the broccoli, we tend to like it just warmed up and crispy so that’s why we didn’t cook it ahead of time. We found that the 15 minutes at the end of the recipe was perfect for cooked but still cruncy broccoli florets. Thanks for visiting and leaving a comment! I totally agree with cooking the broccoli ahead of time–especially the chopped stems. I also decided to add cauliflower, which was way too raw after 15 minutes of baking. Next time I will try baking the broccoli stems and cauliflower along with the squash in the first step. Otherwise the mushroom sauce was absolutely delicious! Thanks Nicole! Cauliflower sounds like a tasty addition! It’s so interesting to hear who likes the broccoli with a little more or less crisp! Thanks for leaving your comment and trying our recipe. Hope you visit again soon! This is a favorite recipe of mine and I make it all the time. Just wanted to let you know that I was struggling to find a healthy green bean casserole recipe I liked for Thanksgiving this year so I decided to make an adaptation using the creamy garlic mushroom sauce from this one and it came out awesome! Thank you for your creation and the inspiration! That’s such a great idea! We’re so happy to hear you love this recipe AND that it worked for a green bean casserole, too! Thanks so much for taking the time to share! Happy Holidays! I have this in the oven right now but didn’t cook the broccoli beforehand. Hope it comes out ok! ? Anything I can replace the coconut milk with ? Could I use almond milk? Good question. We have only made it with coconut milk, which is super creamy so I’m thinking almond milk might be too thin. I would suggest trying cashew milk since it is creamier than almond milk. If you do try another milk, come back and leave a comment to let us know how well it works. Thanks for visiting! Question about the Coconut milk… are we talking thai coconut milk in the can, or coconut milk in a carton like they now carry in the dairy section next to the almond milk? Perhaps Almondmilk creamer would be thicker than regular almond milk? Sure, give it a try and let us know how it goes! I just made it with almond milk and it’s delicoous ??? I also didn’t bake it. I tossed the broccoli in the sauce with it was cooking, and then tossed the spaghetti squash to coat it. Is the coconut milk sweet or unsweet? The coconut milk is unsweetened, and we use full fat coconut milk, so it is quite creamy too. Our favorite brand is Aroy-D, which we order from Amazon, and sometimes it can be found at ethnic or health food stores, too. Thanks for visiting! Could I make this with regular milk and flour? Hi Liz – We haven’t tried this with regular milk and flour since we don’t eat those on the Paleo diet. If you do try it, I’d use heavy cream instead of regular milk to replace the coconut milk. Then, maybe whisk in the flour a little at a time and stop when it thickens up to your liking. Good luck! Any other subs for arrowroot? Only have almond, oat, and coconut flours and want to avoid a grocery run! Hey there – we’ve only done it with arrowroot or tapioca flours, which are most like a cornstarch or traditional flour for thickening sauces. I definitely wouldn’t use coconut flour because it’s too absorbent. You could try a GF blend if you have one on hand or almond flour (blanched almond flour so it’s as fine as possible). Alternatively, you could also just omit the flour and the sauce just won’t thicken up. It will still taste great! Delicious! We cooked it as part of the Whole 30 Challenge and thoroughly enjoyed it. My only change was to add some salt. A healthy pinch of salt made it a great dish. I like that the cooking method didn’t result in overcooked broccoli. The slight crunchiness of the veggies gave it good texture and contrast with the creamy sauce. I have never commented on a food blog before but I had to because I just made this recipe and it was AMAZING!!! Seriously, my husband and I are obsessed! I swapped out the sausage for a few strips of bacon, and then used the bacon grease to cook the mushrooms in, similar to how you used the sausage grease. We will definitely add this to our dinner rotation. Thanks again! We hope you find some other favorites on our site! We had this for dinner tonight and it was gorgeous! I didn’t have sausage in the fridge so swapped it with chicken and bacon and it was perfect. I was worried the sauce would taste coconutty but it didn’t at all to me. Just creamy and garlicky. Loved it, thanks for a great recipe! Hi Karen. Good question. Definitely use unsweetened coconut milk. We use Aroy D brand full fat coconut milk, which comes in a cardboard container and has no additives. You can find it on Amazon here: http://amzn.to/2c1QYAS. You can also use canned coconut milk, just go for the full fat kind that is unsweetened. Thanks for stopping by. Hope you get a chance to make this casserole and love it! Why did my squash come out like mush?? I’ve continued making it but won’t be noodle like for me! The oven, squash size and squash freshness can all affect how the squash turns out. Sorry to hear that your squah turned out mushy, it sounds like it might have gotten overcooked. Was it a small spaghetti squash? The recipe should still taste fine you’ll just have a little different consistency. Thanks for trying our recipe. Ashley – You could omit the mushrooms completely and the recipe should still turn out ok. Also, I think subbing in onions would work. You’d just need to cook them for about 5-6 minutes instead of the 2 minutes noted for the mushrooms. Thanks I’ll try it out! ? If you freeze this dish, how long would it last in the freezer? Hi there! Good question. This dish has not made it to the freezer so far for us. I would think that it would last in the freezer for up to a couple of months though, and I suspect that when you defrost and reheat the dish, it will be more watery and possibly even a little more mushy than when you eat it fresh. If you try freezing it report back, and let us know how it goes. Thanks for stopping by! I made this recipe tonight for dinner and I am obsessed! I love creamy and garlic anything but usually those things happen to be fattening! I will continue to make this.. also I love the crunchy broccoli! I will definitely recommend this to my friends and family! I don’t know what the rest of these people are smoking but this recipe was NOT good! It’s incredibly one-dimensional. I like all of these ingredients in this recipe individually but when they come together in this dish it is not nice. It becomes a game of find the sausage in the mush, which under different circumstances is a game I like playing! Sorry to put a damper on it but I just had to share! Do you know what the WW points would be for this? looking to try this soon. Sounds delicious! Can’t wait to make it! We usually only have regular milk on hand at our house. Would using something like whole milk still be too thin? This was really yummy. I was wondering why the sauce came out a bit tacky, but I realized it’s because I only used a 14.5 oz. can of Coconut milk and 1/4 cup arrowroot. Brought some for leftovers for work. This gives me so many ideas for future casseroles now that I know how to manipulate the sauce. Definitely will make again. Thank you! This is soo good! Made it today. Do you happen to have the nutrition information for this dish? Thanks in advance! can you make this recipe the night ahead and then cook at 425 x15 mins the next day? Excited to try this! It’s in the oven now. I used coconut cream (all I had on hand) and added a bit of regular milk (not paleo of w30 friendly but stumbled on the recipe not looking for those requirements). Also didn’t include any meat, but added some red pepper flakes to bump up the spice factor! It smells delicious! Thank you for the tip on having the store cut the squash!! I am curious if this would taste good with something other than broccoli? I recently found out I am sensitive to my FAVORITE veggie and devestated. Any suggestions? I would love to make this. Just curious, does it taste like coconut? I am not a fan of coconut. No, it doesn’t really taste like coconut at all. The garlic masks the coconut and you get a creamy sauce without the coconut flavor. We hope you give it a try and come back and let us know what you think! This recipe is so amazing, I’ve made it at least 5 times already, my husband loves it! The only addition I’ve added is a bit of fresh thyme, because it goes so well with mushrooms, and some Parmesan cheese when baking. Of course than it’s not dairy free, but oh so good! Hi! This looks really good! What do you think would be a good swap for the sausage to make it vegan? Perhaps another vegetable? Thanks! Awesome, thank you! I will do just that and most likely add cauliflower. I’ll let you know how it turns out. Hi! I finally got a chance to try this out! It was totally FAB… I used sprouted whole wheat flour and just doubled up on the mushrooms then added a 10 oz bag of organic frozen spinach which I left out on the counter to thaw completely and put in a towel to squeeze every last drop of water out. I also steamed my broccoli a bit before adding it. Lastly I added about 1.5 TBSP of vegan sour cream which if you don’t know almost has a cream cheese thickness to it because I only had a 14 oz can of lite coconut milk. It was super YUM! Thank You! I love recipes that are easy to modify to make it vegan…. do you have anything else which can be easily modified that you suggest I try? Would you use almond or coconut flour instead or would it totally change the taste? Just looking for a different supper to make and have all this minus any flour other than these left. Do you know the nutrition facts for this recipe? I made it tonight and it was so yummy! Made this last night and it was awesome…i think I will add some chicken breast to it next time too and perhaps roast my garlic a little beforehand with some good seasonings! We used to live on casseroles and have not had any since going paleo 2 yrs ago so we were like kids in a candy store with this guilt free dish!! ? Thanks for a great one to add to our recipes!! What a great review, thanks so much! Glad you enjoyed it and the addition of chicken and roasted garlic sounds delicious! Would I be able to use almond flour instead? Looks delicious. This was delicious! It definitely satisfies that savory craving while maintaining a healthy diet. We made a few modifications: we cooked the broccoli prior to adding it to the rest of the meal (we like our broccoli on the softer side). We also used 1/4 cup regular white flour (that’s all we had on hand) and it still turned out great. No lumps! We also added a bit more than 2 cups of mushrooms. This meal was fantastic right after cooking it and even more flavorful the next day! We will absolutely make this again and again. Thank you for sharing! Thank you for the amazing review! We are happy to hear that you enjoyed the recipe and will be making it again! Shocked. My non-paleo husband actually ate this and said it was good. I follow the autoimmune protocol and this was super easy to modify (just eliminate black pepper and use a compliant sausage—I used ground pork I seasoned). This was such a nice new flavor combination and I bought spaghetti squash just the other day hoping for inspiration and voila! Thank you! I follow AIP, and made this tonight for a group of my non-AIP friends. We all loved it! I’m adding this to my batch cooking collection. It will be great for those occasional times when I miss my old but now forbidden love, Italian food. The flavors of this were great. However, I ran into one issue. My sauce was nice and creamy in the pan, I couldn’t wait to mix it and put it in the oven. For some reason after being baked the dish became watery. The only thing I can think of is that some liquid came out of the spaghetti squash. The spaghetti squash was not over cooked. In fact, I cooked it less because I HATE when it becomes mushy. Did this happen to anyone else? I was looking really looking forward to this dish and the thick creamy sauce it started out with. Any ideas on substitute for the mushrooms, I can’t eat them. Or can they be left out. I question this because two cups is a lot to just leave out. Also, I’ve never used spaghetti squash, I have two small ones hanging out in the garden. I’m wondering about how much squash is actually used in this recipe? any ideas on the nutrition facts for this dish? Hi there – As part of our Paleo lifestyle, we don’t track nutrition info. We’ve found that eating this way we don’t have to worry or hyper focus on nutrition labels, so we don’t have the nutrition info available. Sorry about that. We hope you’ll still add this one to your rotation and find some other recipes to love on our site, too! Hi! I made this tonight and it was delicious but as I was eating it, it got almost gummy like? Big hunks of just weird gelatinous pieces, completely changed the texture and I couldn’t eat it anymore. I followed the instructions and used the same ingredients, just subbed onions for the mushroom. Any suggestions? Dang! That’s no fun. Sorry! It’s the flour used to thicken up the sauce. If you don’t get it completely dissolved before adding in the coconut milk it can get clumpy like jello. Hope that helps for next time! It’s worth trying again! Thanks for taking the time to try our recipe and share your experience. Made it exactly to the recipe and it was FANTASTIC! Thank you! Loved this, I used oyster mushrooms (low FODMAP) For the sauce I used tapioca starch, asafoetida and a little mustard powder with veggie stock in the place of garlic Thanks will def make again ! This recipe was outstanding! I doubled the garlic and went with a vegan sausage as we are vegan. I also added brussel sprouts. I went with roasting the veggies and just tossed them in olive oil and seasoning. I added them to the oven when the spaghetti squash had 15 minutes left and they came out perfectly! This recipe will definitely become a regular in my house! Thank you!! So glad you enjoyed the recipe and were able to make it work with vegan sausage! Thanks for taking the time to leave a comment! So how exactly do you cook your broccoli? I didn’t see it mentioned in the directions part of the recipe. Thank you! This sounds delicious! 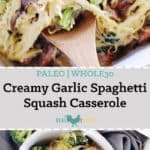 I was looking for a new paleo spaghetti squash recipe, and found this. I used ground turkey since I already had some, and used coconut oil to sauté the mushrooms since there was no fat left in the pan. Once I added the arrowroot flour it was all stringy and gloppy, and I thought we might be eating out tonight! Once I stirred in the coconut milk, and kept stirring, it looked like it might work. I also think I used a large squash because there really wasn’t enough to cover all the “spaghetti “. I was worried about the broccoli, but we liked that it was a little crunchy. My husband and I both thought it was ok, and I’ll probably try it again sometime, with some minor changes. I really wanted to review this to give you a easy tip for cutting the squash in half! Poke holes all around the squash, then microwave it for 3 – 5 minutes just to soften it. You’ll be able to cut it without worrying about slicing off your fingers! Thanks for the tip on how to cut the squash! Sorry you thought the recipe was just ok. Using turkey definitely changes the recipe because it has less fat (and flavor) than sausage and thus it may have turned out a little bland. Hopefully it works out better the next time you make it (either by following the recipe or with your desired substitutions). Hey there! Is there another gf flour I can use? Either a gf blend, almond or coconut flour? Thanks! Sorry the recipe turned out watery. Sometimes the spaghetti squash or veggies can add a bit of water. Next time you could try squeezing the spaghetti squash with a cheesecloth or paper towels to remove any excess water. Thanks for trying the recipe! So good almost has an Alfredo taste. I would like to try with chicken next time . Has anyone tried to freeze this meal? I would like to know the nutrition facts for this meal if at all possible! Hi! I am super excited about this recipe but I would like to swap the sausage out for a leaner meat like chicken. I read through a lot of your comments to see if there’d been any modifications but couldn’t find one for using chicken. Would you be able to advise me how to modify the making of the sauce without having the fat from cooking the sausage? I would love to be able to make this recipe. Thanks for sharing your awesome recipes with us! Your response time is AMAZING!!! Heading to the store now! Thanks so much and will definitely let you know how it turns out! xo! Any ideas to sub in for mushrooms? I was thinking maybe spinach, roasted red peppers, and/or tomatoes?? I LOVE mushrooms but I want to take this as my contribution for dinner at a family gathering. My mother in law (loudly and persistently) hates mushrooms and I want them all to be impressed with my new way of eating and avoid any negative feedback. The peppers would probably be best since the tomatoes and spinach might get too watery. Let us know how it goes if you try it! This is so delicious! I made it as written in the recipe except I steamed the broccoli ahead of time (team pre-cook!) and I added three whisked eggs! I have another similar recipe that uses the eggs, it creates an extra binding factor, adds great flavor, and a browned crust on top. It turned out great! I also used Almond flour, it was a great success! What’s the best way to prep this ahead and just re-heat at dinner time? Is it possible? Can i make the whole thing following the above directions and then just put it all back in the oven a couple hours later? Yes, you can just prep the whole thing and pop it back in the oven later! You might have to increase the cooking time though, just check it after 15 minutes and cook it more if needed. This recipe was phenomenal! It will cure my craving for Alfredo. I’m not a huge fan of sausage, so I substituted chicken that I cooked in my instant pot. It worked great! Added a little crushed red pepper for some kick. The sauce was really heavy on my stomach, so next time I plan on using 1/2 full fat and 1/2 carton coconut milk. Recommend this recipe 100%! So glad you liked it, thanks for the comment and rating! This was amazing! Great leftovers too. I doubled the mushrooms because I’m a mushroom freak, added sauteed onions, steamed broccoli for a few minutes, added a few extra spices, used regular flour (it’s what I had on-hand) and it turned out fine. Topped with a bit of mozzarella cheese before putting into oven. Very much a comfort food recipe. Thank you for the idea!!! Oh I also blotted the spaghetti squash pretty good with paper towel to remove excess water before mixing together and putting into oven. I think this helped a lot. I loved this dish! Spaghetti squash is one of my new favorite ingredients and it is perfect for Whole30. This recipe in particular was an absolute show stopper and I will certainly be making it again and again and again!